These Kettle Cooked Chips were crunchy, but not necessarily as hard and firm as Chips of this cooking style usually are. There was a good, crisp, snappy crunch, which was more like a regular Chip crunch. The Kettle Cooked Chip presentation often reveals a bunch of squiggly wriggly shapes and sizes, but these seemed a little more regular in appearance. There were some hardened oil bubbles and a few shattered bubbles that affected the integrity of a few broken Chips. There was a good and even darkish orangy red seasoning covering the Chips. 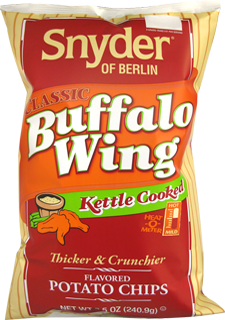 It may just be us, but we think this flavor should be called Buffalo Wings, rather than 'Wing'. Anyway... The 'Sugars' on the back of the bag said zero, but these tasted a little sweet. So that was a good trick. The next trick was to make them taste like Barbecued Chicken Wings. Snyder of Berlin managed that too. They also packed a little hot punch. Well done.